Federal Reserve Board Chairman Alan Greenspan, 29 August 2003. Alan Greenspan’s remarks were obvious, even when he made them. For several decades, central bankers have been the key risk managers for the economy and the financial system. Unfortunately, just a few years after Greenspan spoke, it was clear that they had failed spectacularly; during 2007 and 2008, risks that were unaddressed turned into crisis. The regulatory reforms since 2009 – capital and liquidity requirements, resolution regimes, restructuring of derivatives markets, and an evolving approach to systemic risk assessment and (macroprudential) regulation – have all been directed at improving the resilience of the financial system. As a result, the likelihood of another crisis-induced plunge in GDP is much lower today than it was a decade ago. But we still have plenty of work to do. We are at an early stage in the process of building a financial stability policy framework that corresponds to the inflation-targeting framework that forms the basis for monetary policy. Such a framework requires measurable financial stability objectives that are akin to a price index, tools comparable to an interest rate, and dynamic models that help us to understand the link between the two. In this column, we describe a step forward in developing such a framework: the concept and measurement of GDP at risk. Based on recent work by Adrian et al. (2017), Chapter 3 of the IMF’s October 2017 Global Financial Stability Report (IMF 2017) estimates a time series for global GDP at risk using a technique called quantile regression. It is worth taking a small detour to understand this important and useful tool. Standard statistical methods, the ones we commonly teach, allow us to address questions such as: If some external factor, like oil prices or government spending, changes, then how will that alter the expected path of growth, employment or inflation over the next year or two? Knowing the answer to questions like these helps policymakers use their tools to stabilize the economy. That is, for the central bank to successfully maintain inflation at its target, members of the monetary policy committee need to understand how the economy usually evolves for a given path of interest rates (their conventional tool) when conditions change. Using this technique, IMF researchers compute the probability distribution of the one-year-ahead forecast for global growth. The solid red line in the chart is the median of this forecast distribution: we can think of this as the central forecast for global growth. 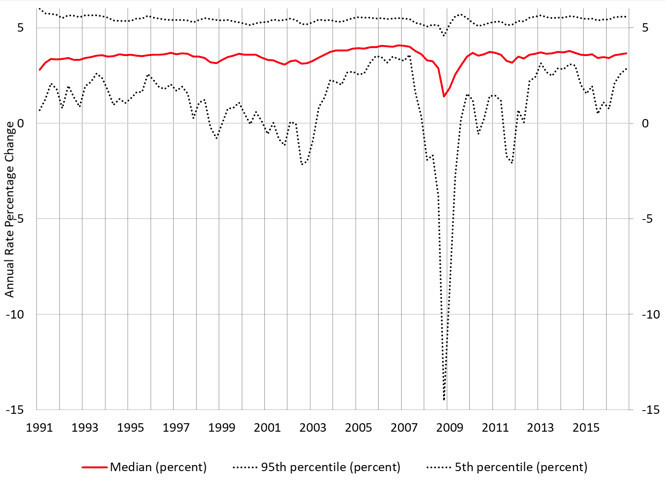 The upper and lower dashed lines are the 5th and 95th percentiles of the distribution, respectively. So, for example, in the fourth quarter of 2016, the median forecast for growth in 2017 was 3.67% – that’s the final point on the red line in Figure 1. The dashed lines tell us that the there is a 5% chance that growth will be above 5.58% and a 5% chance that it will be below 2.86%. The lower dashed line – the one that spikes down in late 2008 – is a measure of GDP at risk. Source: IMF (2017), Figure 3.1.2. Figure 1 also reveals some fundamental properties of the IMF’s estimates. The level of the top dashed line hardly changes. In fact, over the entire 25-year period studied, the 95th percentile of the GDP growth distribution moves between a high of 5.99% and a low of 4.57%. This is in sharp contrast with the measure of GDP at risk (the lower dashed line), which ranges from +3.59% to ‑14.53%. Importantly, these large downward movements are temporary – for most of the period since 1991, GDP at risk is not far below the median. Source: Based on Figure 3.1.2, IMF (2017). These patterns are consistent with Milton Friedman’s (1993) plucking model of business fluctuations, based on his observation that growth tends to exhibit extended episodes of smooth, upward movement, punctuated by occasional cyclical contractions of shorter duration. That is, business cycles are inherently asymmetric – while the unemployment rate displays temporary jumps in recessions (say, from 5% to 10%), it does not plunge in booms from 5% to 0%. And, usually, it is not very far from 5%. Why is the lower tail of the growth distribution so much bigger than the upper tail? One explanation starts with the fact that there are short-run constraints such that producing above capacity entails sharply higher costs. By contrast, on the downside, the only limit is that firms shut down. That’s a decline of 100%. Twenty years ago, Kim and Nelson (1999) showed that US GDP exhibits exactly this asymmetry. More recently, Dupraz et al. (2017) develop a model that generates these features. We see GDP at risk as a big step forward for policymakers. It is a complement to SRISK, the NYU Stern School Volatility Lab measure of the aggregate capital shortfall in the financial system. In addition to serving as an indicator of financial vulnerability, SRISK also tells us which individual intermediaries are contributing to that vulnerability. GDP at risk helps us to understand the linkages between the financial sector and the real economy at an aggregate level, and can tell us whether an increase in leverage outside of the financial sector increases the likelihood of a severe economic collapse. GDP at risk has four useful characteristics. First, it is directly based on our ultimate objectives: high real economic growth and low unemployment. These are the foundation for improvements in social welfare. Second, because GDP already is one of the most widely understood economic concepts, using GDP at risk simplifies policy communication. Imagine two conversations, both between a policymaker and elected officials charged with overseeing the central bank to which they have delegated the role of maintaining financial and economic stability. The first discussion focuses on a measure based on the details of stress tests and network effects – the nuts and bolts of macroprudential policy. The second is anchored by the idea that policymakers should limit the likelihood of an outsized fall in GDP over the next several years. For example, those responsible for policy might say that the odds of a 5% drop over the coming two years should be less than one in ten (i.e. a 10% probability). While technical experts need to have the first conversation among themselves, the second is likely to be much more effective in helping others anticipate policy choices, and in accounting for them after the fact. Third, provided we accept the centrality of GDP at risk, we can translate much of the machinery of inflation targeting into a financial stability policy framework. Financial Stability Reviews would look like today’s central bank Inflation Reports, with forecasts of GDP at risk at various horizons replacing the path of inflation projections. 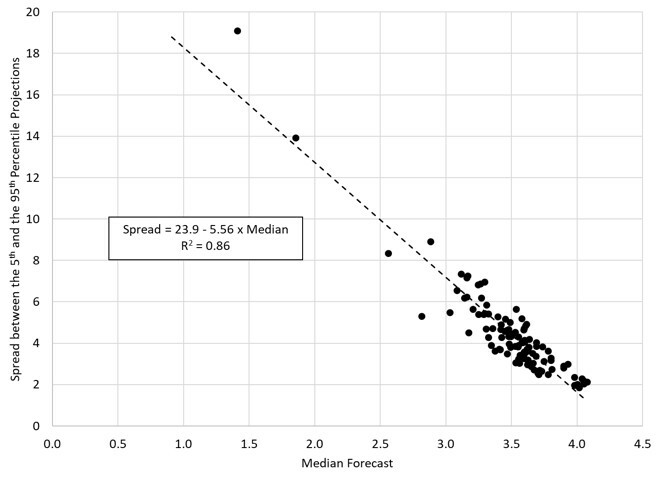 Of course, such forecasts require an understanding of what makes GDP at risk rise or fall. How important is corporate leverage relative to household leverage? How important are equity versus property price booms? What is the impact of fiscal policy? What types of cross-border capital flows create the biggest vulnerabilities? Finally, GDP at risk can help discipline discussions of policy trade-offs. At short horizons, central bankers aim to encourage risk-taking when they lower interest rates – faced with an economic slowdown, they wish to stimulate lending. Over longer horizons, however, increased private leverage can create fragilities. So, policymakers want to know the extent to which lower interest rates reduce GDP at risk in the near term, and raise it in the longer term. There are surely many other examples as well. For several decades prior to the crisis, many central banks with a price stability objective had achieved low and stable inflation. Today, with financial stability taking on such importance, we also expect central bank policies that will lower the probability and the severity of a crisis. But delivering on this means having appropriate risk measures, the tools for maintaining stability, and models that link the two. GDP at risk is an important step forward in meeting this challenge. Adrian, T, N Boyarchenko and D Giannone (2017), “Vulnerable Growth,” Federal Reserve Bank of New York Staff Report No 794, revised November 2017. Cecchetti, S G (2008), "Measuring the Macroeconomic Risks Posed by Asset Price Booms," in J Y Campbell (ed. ), Asset Prices and Monetary Policy, Chicago, IL. : University of Chicago Press, p. 9-43. Cecchetti, S G and H Li (2008), “Measuring the Impact of Asset Price Booms Using Quantile Vector Autoregressions,” unpublished manuscript, Brandeis International Business School. Dupraz, S, E Nakamura and J Steinsson (2017), “A Plucking Model of Business Cycles,” unpublished manuscript, Columbia University. Friedman, M (1993), “The ‘Plucking Model’ of Business Fluctuations Revisited,” Economic Inquiry 31(2): 171-177. Greenspan, A (2003), “Monetary Policy under Uncertainty,” remarks at a symposium sponsored by the Federal Reserve Bank of Kansas City, Jackson Hole29 August 29. IMF (2017), Financial Conditions and Growth at Risk, Global Financial Stability Report, October, Chapter 3. Jorion, P (2000), Value at Risk: The New Benchmark for Managing Financial Risk, 2nd. New York: McGraw-Hill. Kim, C-J and C R Nelson (1999), “Friedman's Plucking Model of Business Fluctuations: Tests and Estimates of Permanent and Transitory Components,” Journal of Money, Credit and Banking 31(3): 317-334. Kroenker, R and K F Hallock (2001), “Quantile Regression,” Journal of Economic Perspectives 15(4): 143-156. The classic reference is Jorion (2000). For a technical introduction, see Kroenker and Hallock (2001). For an early application, see Cecchetti and Li (2008).